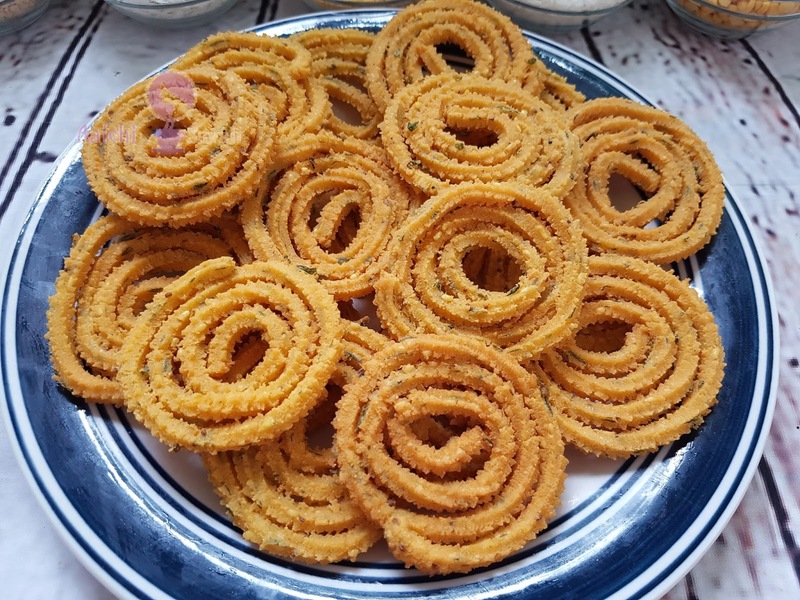 mine that how to prepare Chaklichi Bhajani or Multigrain Flour to make chakli. So today I have prepared this chakli from healthy, nutritious and homemade chakli flour or multigrain flour. 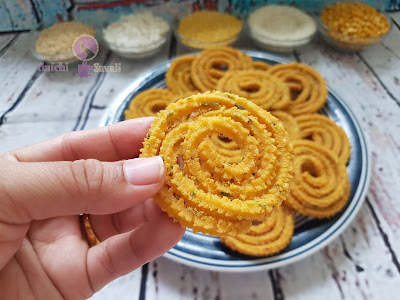 This chakli is the most favorite crunchy snack in India, specially prepared in every house during Diwali along with many other delicacies. 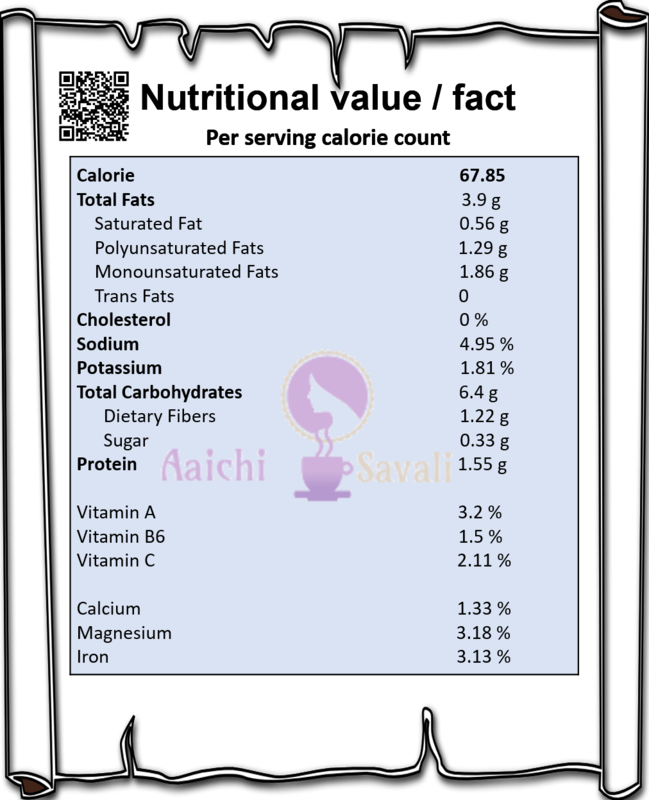 Chakli is a best savory evening snack with tea in India. 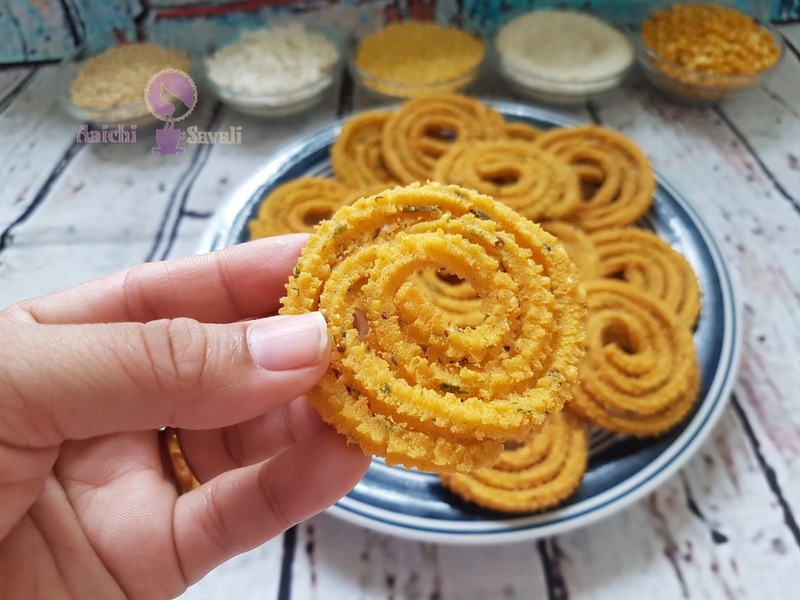 Chakli is also known as चकली(chakali) in Marathi, ಚಕ್ಕುಲಿ chakuli in Kannada, Gujarati - chakri, Telugu - chakralu, and Konkani - Chakri. There are various methods to make chakli. Murukku, a similar recipe of chakli typically made with rice flour. Kadboli is a similar recipe of chakli, but the only difference is that the Kadboli shaped by hand instead of an extruder. 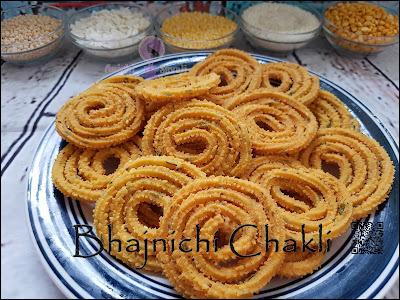 Bhajnichi Chakli is made as a part of the Diwali faral (Diwali snacks & sweets) in Maharashtra. This turn out very crispy (कुरकुरीत), crunchy. So give it a try and make this snack more healthy and tasty. Each Serving Contains 67 kcal. Turn on flame and place a saucepan, now add 1 cup of water in pan and heat it. 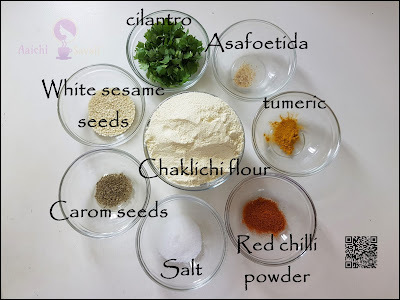 Once water gets boiled, add asafoetida powder, carom and cumin seeds, turmeric powder, red chilli powder, salt, sesame seeds, veg oil 1 tbsp and mix all masala in water well. Bring water to boil. Once water starts to boiling, turn off flame add chaklichi Bhajani and mix all very well. Cover saucepan with lid for about 5 minutes. After 5 minutes, transfer the flour into the mixing bowl and knead to make a soft dough (if needed add hot water). Now , grease Chakli press utensil with oil and stuff enough dough into chakli extruder(utensil). 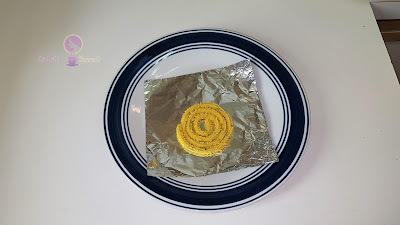 Place a plastic or parchment paper and over parchment paper press and move into circular motion to make chakli(as shown in video). medium flame, until it turns golden color. Keep it on kitchen napkin to remove excess oil. Here, crispy, healthy and nutritious Multigrain Flour / Bhajanichi Chakli is ready to serve. Enjoy!!! Based on a 2000 calorie diet. It makes 20 servings. 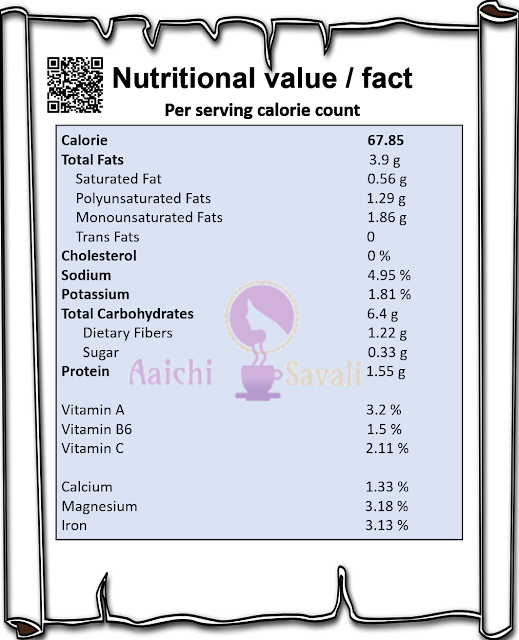 Per serving contains 67.85 calories, along with carbohydrates - 6.4 g, dietary fibers - 1.22 g, fats - 3.9 g, proteins - 1.55 g.
It's good to eat Chakali as a snacks. I just adore this recipe, Doc! Growing up in Singapore, we just called this murku, along with all the others. And yes, it was always around at Diwali, but because Singapore is so multicultural that you would also find it on the festive table during Eid and Christmas, especially because there are many Indian muslims and Christians. I love that you have used a multigrain flour. Many thanks to you Azlin. Your comment and appreciation is lot to me. I keep sending your recipes to my mother. You are an awesome cook! Thanks a lot to you Lensq. I am glad to know that you liked it and you shared it.